The Azera's Bluetooth connectivity is a port-installed option; it's not as well-integrated as some systems, so pair it up with your phone and see if it agrees with you before you buy. Spacious, handsome, and unremittingly conservative, the 2011 Hyundai Azera is a great alternative for folks who think the company's Sonata is a bit risque. In a day when Buick doesn't even build cars like they used to, a few car companies have gone against the grain, gone a bit retro. Buick's no longer about softly tuned suspensions and effortless acceleration--but cars like the Hyundai Azera still prize those attributes, and pay homage to their American ancestors with cushy comfort and plain looks. The 2011 Azera draws to a close the "Buick" era at Hyundai--a new car is coming for 2012, and its styling is considerably more exciting. The Azera still represents a perfectly fine driving experience, of a kind, and represents a huge value to shoppers who need lots of interior room, good fuel economy and an extensive warranty. The front-drive Azera is conservative, but not to a fault. The sheetmetal's tidy and fault-free; the interior's a bit less cautious, without being the least bit provocative. The same goes for the Azera's choice of V-6 engines, and for its handling: you'll never get there too fast, or too riled up from a hot set of corners. You'll get there relaxed and calm, exactly like the Azera will get there. The trump card in the Azera's hand is cabin space. The front seats are cozy and wide, with lots of knee and head room for even taller drivers. The back seat's huge, so huge an adult male can cross leg over knee, seated behind another adult male, and barely make contact with the front seat back. Safety scores are a bit disappointing, and Hyundai's missed out on some new high-profit technology: the Azera doesn't offer a rearview camera or parking sensors, and its Bluetooth and navigation systems leave something to be desired. In the case of the GPS, that's a lot--opting for it means losing the USB port. You know, the thing the kids' iPod needs to play? Hyundai's exceptional warranty coverage, the vast back seat, and the Azera's relentless respectability put it in good stead for a pool of buyers who can appreciate the way things used to be. It's not quite up to the Avalon's par, but it's aged remarkably well in the past five years--and no one's going to fault you for paying just $26,000 for this much car. Conservative looks have made the 2011 Hyundai Azera a loner in its own family. Just a few years ago, the Hyundai lineup had about as much visual jazz as an ISO 9001 PowerPoint. Hyundai decided it needed big drama to make itself better-known, and that's why we have Sonata, Veloster, and Elantra. The 2011 Azera's a hold-over from the old school. Granted, it's in the last year of its life in the U.S. market, but there's no getting around the fact that the Azera just doesn't look like a Hyundai anymore. The Sonata and Elantra are catchy, curvy, crested with chrome...and the Azera is anonymous in a way that probably makes Toyota's most cautious designers blush with envy. Anonymity has its place in the world, but not in a niche where the Nissan Maxima and Buick LaCrosse set the dashing pace. Setting the "statement" factor aside, there's everything to admire about the Azera's quiet attractiveness, the way it goes out of its way to attract attention--or to detract from bigger, more expensive Genesis or Equus sedans. Inside, the Azera takes a bit more risk. The interior clearly preceded the carefully surfaced, well-executed piece on the Genesis luxury four-door. Some of the same sculpturing shows up on the Azera's dash, and it's handsome even alongside decent-quality woodgrain trim. It's a modern look circa 2009, all still perfectly tasteful, but without the adventurous take you'll see inside a Sonata. Hyundai's made some minor tweaks to the Azera for 2011, but it's a challenge to spot them at a glance. The grille and decklid have been slightly reshaped; the wheels are new; and the center console has new graining on its metallic finish. 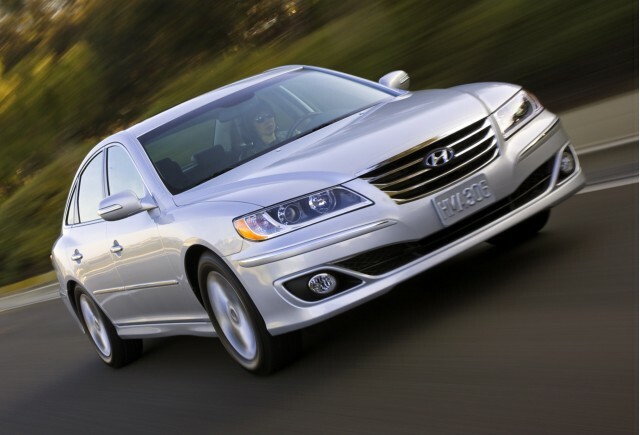 Curvy roads throw the 2011 Hyundai Azera for a loop, but it's a great, sedate long-distance cruiser. Soft, almost pillowy suspension tuning makes today's 2011 Hyundai Azera perform like the big Buicks of the past. That's more a compliment than you may think. The 2011 Azera is offered with a choice of powertrains. The Azera GLS comes with a 3.3-liter V-6 making 260 horsepower and 233 pound-feet of torque. The numbers are perfectly respectable, and so is acceleration--particularly now that the Azera comes with a six-speed automatic transmission, which boosts its fuel economy numbers from mid-pack to near-head of the class. 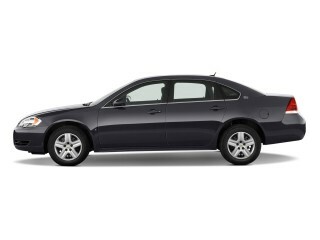 The optional 3.8-liter V-6 makes 20 more horsepower and 30 additional pound-feet of torque, and yet at 283 hp and 260 lb-ft of torque, it's matched by the smaller 2011 Chrysler 200. The Azera carries significant weight, too, but the bigger engine still delivers 0-60 mph times of about 7.1 seconds, Hyundai predicts. That makes it feel a bit more lively than the base 3.3-liter Azera, and possibly worth the premium price. Fuel economy doesn't dip much, either--just a mile per gallon in the city cycle, two on the highway. Handling is where cars like the Azera lose out to smaller, more sporty entries. While Hyundai's new Sonata wins raves for a taut ride and fast steering, the Azera's default settings are dialed down into the Metamucil zone. It's predictable, secure, and set up to understeer all day long--but the Azera also has plenty of body roll, and plenty of looseness in its steering feel. Toyota's Avalon probably is a bit better at controlling itself in hard corners, but both vehicles aim for a ride/handling feel from a less recent vintage--and in truth, there's absolutely nothing wrong with the way they track down the highway silently, unruffled, and in the Azera's case, with just a touch of bouncy rebound over highway bumps taken at an 80-mph cruising speed. If it's interior space you need, the 2011 Hyundai Azera carves out its size-large place alongside the Avalon and Taurus. In terms of interior comfort and cargo space, the 2011 Hyundai Azera isn't without flaws. It is quite spacious, though, even if its interior materials are a little less than luxurious, in places. The Azera is a large sedan, with truly vast cabin room. There are 44 inches of front-seat legroom and more than 38 inches of rear-seat legroom, numbers rivaling some long-wheelbase luxury sedans from Germany. The space gives the Azera a leg up on comfort, but we think it could use better seats. 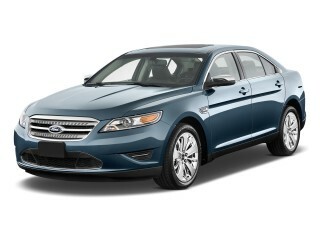 The driver sits very high--it's almost like being in the old Ford Five Hundred, the predecessor to today's Taurus. The high seating position helps with visibility, but it means some taller drivers will find less headroom, especially under the available sunroof. The power front seats and power-adjustable pedals help matters, and the seats at least have good bolstering for the class. The back seat has palatial room, enough for adults to cross leg over knee, barely grazing the front seatbacks. The rear bench is comfortable, too, with its own fold-down armrest and its molded-in cupholders. The rear seats fold down along a 60/40 split, opening up the Azera's cabin to packages too big to fit inside its 16.6-cubic-foot trunk. While that's a sizable space, it's almost 20 percent smaller than the huge bin built on the back of the current Ford Taurus. Hyundai does a good job with interior materials in the Azera. They're reasonably upscale, with good matte and gloss finishes, if not quite the state of the art. The Azera's better at maintaining peace and quiet, with minimal road noise and only a slight growl from the V-6 at full throttle. The 2011 Hyundai Azera offers all the features expected in a large luxury car, though its crash-test ratings aren't excellent. In a class where five-star safety is nearly universal, the 2011 Hyundai Azera falls shy of the best scores. For the 2011 model year, both the National Highway Traffic Safety Administration (NHTSA) and the Insurance Institute for Highway Safety (IIHS) have changed the criteria they use to rate crash protection. For that reason, the NHTSA hasn't published scores for this year's Azera, and since it's being replaced in 2012, it's not likely to update its star ratings on the current car. The IIHS, meanwhile, says the Azera offers "good" protection in frontal impacts. Side impact protection is deemed "acceptable." The Azera has plenty of safety technology built in. Standard equipment includes dual front, side and curtain airbags; anti-lock brakes, traction and stability control; and active front headrests. 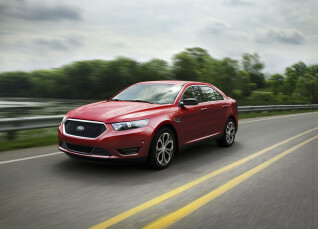 Rear side airbags are also fitted, and an unusual feature for the cost-conscious sedan class. The Azera doesn't have a rearview camera, parking sensors, blind-spot detectors, or similar safety equipment becoming more common in the segment. The 2011 Hyundai Azera only leaves a few features on the options list, especially in Limited trim; Bluetooth and GPS installations have drawbacks. For the money, the 2011 Hyundai Azera outclasses its competition with more standard equipment. Pitted against the likes of the Taurus and Avalon, the Azera comes in two trim levels. The base GLS brings with it the smaller-displacement V-6 along with standard power windows, locks, and heated mirrors; a tilt/telescoping steering wheel; keyless entry; cruise control; AM/FM/CD/XM satellite radio with a USB port and an auxiliary jack; dual-zone climate control; a garage door opener; and steering-wheel audio controls. A Premium package offered with the GLS adds on leather seating; heated front seats; leather-wrapped steering wheel and shift knob; and a power glass sunroof. The 2011 Azera Limited takes all the GLS equipment, swaps out the drivetrain for the larger-displacement, 3.8-liter V-6, and moves up to 17-inch wheels. Also standard on the Limited are the GLS' Premium package content; a six-CD in-dash changer with Infinity speakers; a power rear sunshade; woodgrain trim for the steering wheel; power adjustment for the steering wheel; and more metallic trim inside and out. The Azera Limited has an option for a navigation system made by LG. It's bundled with a 605-watt audio system with Infinity speakers--but to get it, you'll lose the USB port, auxiliary jack and the in-dash CD changer, an odd circumstance that leads us to recommend an inexpensive portable GPS instead. Bluetooth is available, but it's a port-installed option. The 2011 Hyundai Azera moves smartly to the front row with near-class-best fuel economy. With a new six-speed transmission in gear, the 2011 Hyundai Azera's fuel economy has improved by anywhere from 5 to 10 percent, bringing it close to the top of the full-size sedan segment. With its larger 3.8-liter V-6, the Azera earns a 19/27 mpg rating, which brings it ahead of entries like the Ford Taurus, Chrysler 300, and Buick Lucerne--and so long as we're counting, the Porsche Panamera. 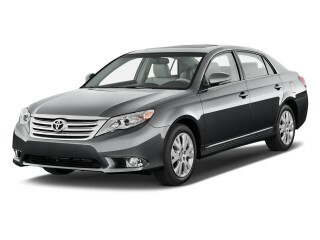 Hyundai hasn't said whether it will introduce a hybrid Azera, but the model will be replaced in the 2012 model year. Looking for a different year of the Hyundai Azera?